Microscope video cameras connect either through a microscope eyepiece or on a c-mount adapter to the trinocular port of the microscope. 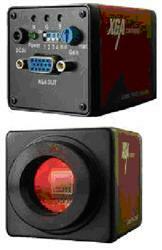 Digital video microscope cameras provide a better frame rate than standard microscope digital cameras usually do. Microscope video cameras will allow for direct connection to a TV, LCD project or monitor and provide high quality streaming live video directly from the microscope. High definition video cameras are available and have a minimum of 1080 lines of TV resolution. Several of the digital video microscope cameras allow for capture of images directly to an SD card.